Water can accumulate in fuel tanks from condensation, contaminated fuel, or leaky filler cap gaskets. Also, reformulated gas (RFG) has been known to attract water. Water Zorb disperses and emulsifies water right into the fuel, allowing it to pass through filters and safely burn away with the fuel. Water Zorb can be used as preventive maintenance at 1 oz. to 18 gallons of gas. For larger water accumulations, it will totally emulsify its own volume of water. MDR-586 Size: 8 fl. oz. MDR-567 Size: 16 fl. oz. MDR-569 Size: 32 fl. oz. Water in diesel fuel can sabotage diesel engines if not removed. Microbes need water to grow and water, even in small amounts, can promote rust and corrosion, along with sludge that can clog injectors and filters, shutting down the engine. For larger water accumulations, it will totally emulsify its own volume of water. MDR-559 Size: 16 fl. oz. MDR-580 Size: 8 fl. oz. MDR-581 Size: 16 fl. oz. Gasoline START FRESH helps reduce maintenance by combining the best of MDR gasoline additives into a Spring treatment to give gasoline a fresh start. Fuel containing ethanol has lower combustibility thereby reducing fuel economy and engine performance. Ethanol also has an affinity for water or condensation right out of the humid air brought in through the fuel tank vent. Un-checked, this can lead to phase separation, fuel system corrosion, clogged carburetor jets or injectors, filters and ultimately engine breakdowns. Left in the fuel tank for over 30 days, E-10/E-15 will begin to degrade causing gum and sludge to form, clogging filters. PEP Fuel Conditioner will eliminate all of these problems, revitalizing engine performance in 2 or 4 cycle engines that use ethanol (E-10/E-15) gas. PEP contains antioxidants, de-gummers, metal deactivators, corrosion preventative compounds and stabilizers to fight ethanol problems. PEP also addresses the phase separation problem caused by excess water accumulation. Economical to use “in season” with 1 oz. treating 10 gallons of gas and 1oz. to 5 gallons for long term storage. MDR-570 Size: 8 fl. oz. MDR-571 Size: 16 fl. oz. MDR-576 Size: 8 fl. oz. MDR-574 Size: 16 fl. oz. MDR-575 Size: 32 fl. oz. It only takes approximately 3/10 of 1% of water acquired by condensation, a loose gas cap or refueling with contaminated gas for phase separation to occur, taking with it up to 75% of the ethanol. E-ZORB will totally emulsify its own volume of water/ethanol back into gas, allowing it to pass the finest filters and burn through safely. E-ZORB contains NO Alcohol or Methanol. MDR-556 Size: 32 fl. oz. MDR-557 Size: 32 fl. oz. Prevents fouling of injectors and plugging of screens as a result of sludge. Developed to dispense sludge in diesel fuel tanks and permit fuel to flow and burn. Sludge, which is a combination of water, dirt, rust, microbe growth, corrosion and oil deterioration, produces deposits that clog small oil passages, clearances, filters and screens. Stor-N-Start has been formulated as a PURE stabilizer that does not contain all year-round additives like carb cleaners that are not necessary during long term storage. In fact, they can drop out during storage and cause unwanted gum and varnish deposits. Totally draining fuel tanks for long term storage is not recommended as partially full tanks will condense more water and corrode internally. Also, the fumes in an empty tank are more dangerous than a full tank. Stor-N-Start’s triple action protection is the most up to date product for long term storage. It fights gum formation three ways with additives to stop, retard, and deactivate gum buildup. This helps control engine running problems such as sticky valves, clogged filters, fuel injectors and carburetors. 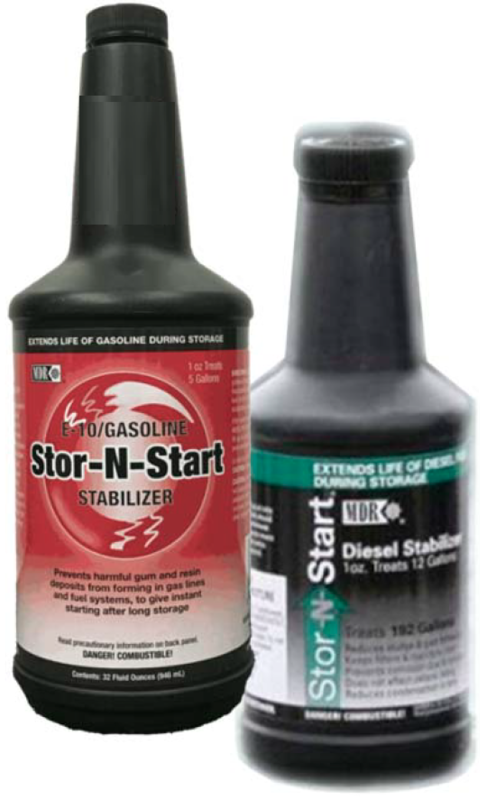 Stor-N-Start also contains corrosion inhibitors and anti-oxidants to keep the entire fuel systems ready for quick Spring start-ups and smooth running engines. MDR-600 Size: 8 fl. oz. During storage, motor oil eventually drains off cylinder walls, pistons, rings, bearings, and all other internal metal engine parts, exposing them to corrosion. Crankcase Stor-N-Start forms a protective shield on all internal parts, preventing rusting during storage. Before lay-ups, pour into crankcase and run engine for 10 minutes. Treats 5 quarts of oil. ReLead acts as a protective lubricant to prevent direct metal-to-metal contact that otherwise would cause increased valve seat wear. This high temperature protection is continuously maintained when ReLead is added to gasoline. The benefits of ReLead are clear…dependable operation and longer engine life. MDR-590 Size: 8 fl. oz. © 2019 Marine Development & Research. All rights reserved.